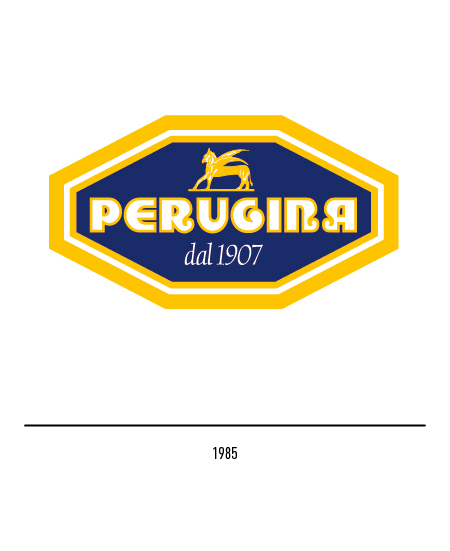 Perugina's history begins back in 1907 as the "Società perugina per la fabbricazione dei confetti" established by Francesco Andreani, Leone Ascoli, Annibale Spagnoli and Francesco Buitoni. 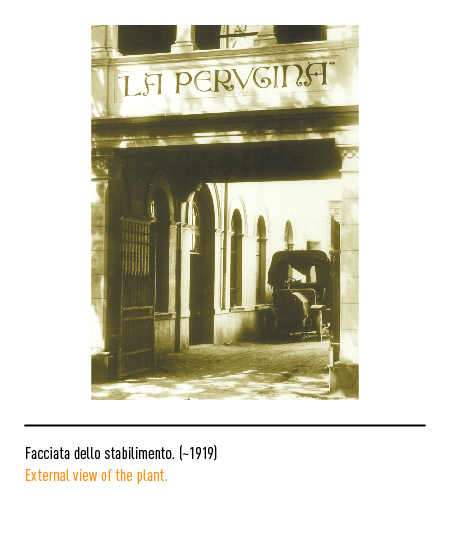 The latter partner was a member of the family by the same name that owned a pasta factory at San Sepolcro in the Province of Arezzo (see Buitoni). 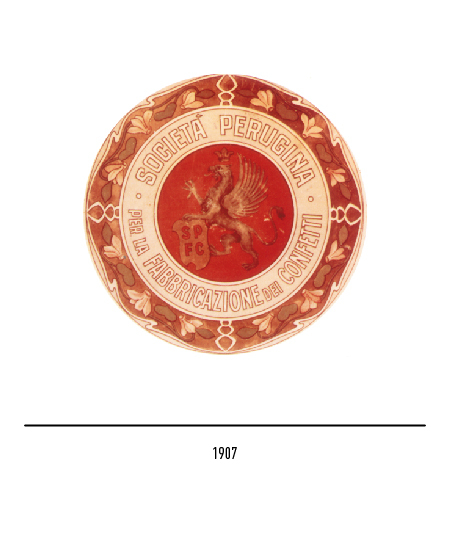 The firm's first trade-mark portrayed a left-facing griffin, emblem of the city of Perugia, and a shield bearing the acronym "SPFC". 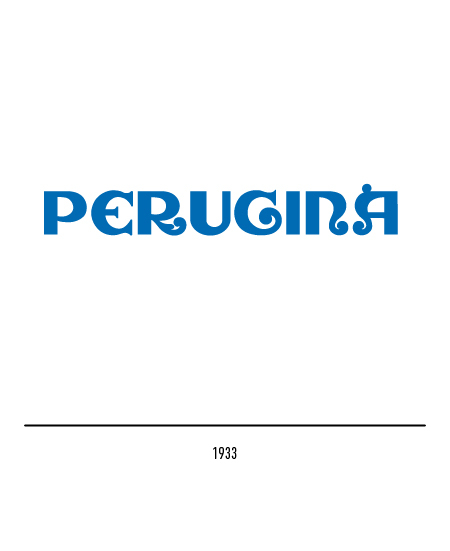 Chocolate-making was commenced after the Great War so that in 1920 the firm changed its name to "La Perugina, Cioccolato e Confetture" and then simply to "Perugina" in 1923. 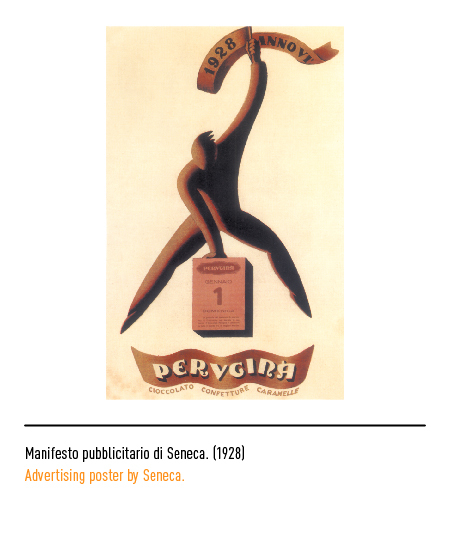 The trade-mark was consequently changed becoming more essential. 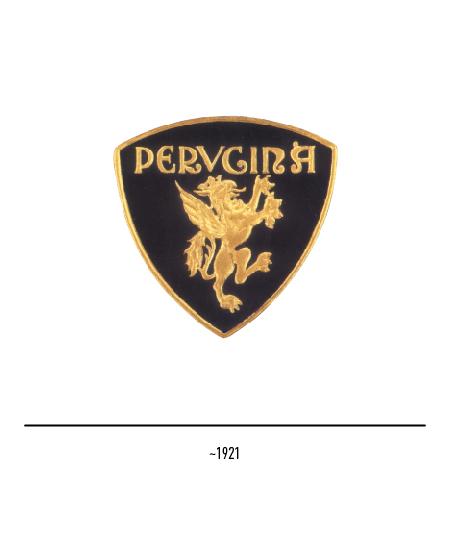 The griffin was retained but made to face to the right, while Medieval-style lettering was adopted with the letter "R" embellished by a typical hook and the letter "A" by a curl. 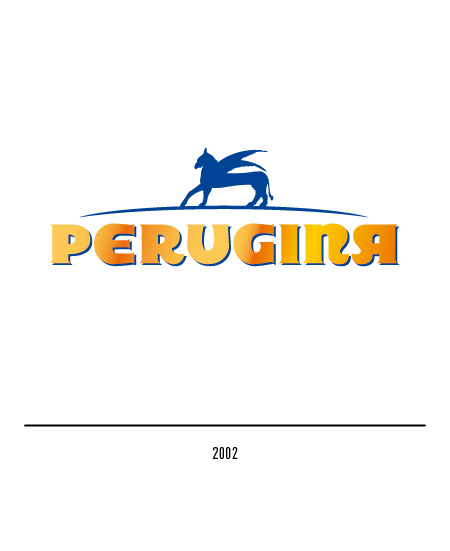 In the late twenties Perugina position in the confectionary sector in Italy was strengthened. 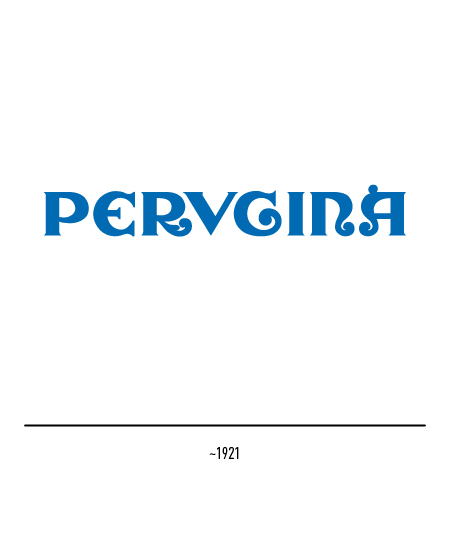 In 1931 the trade-mark came in for some restyling to confer it a more modern look and the Fascist-style "V" was replaced by a "U", while in 1933 a version without serifs appeared. 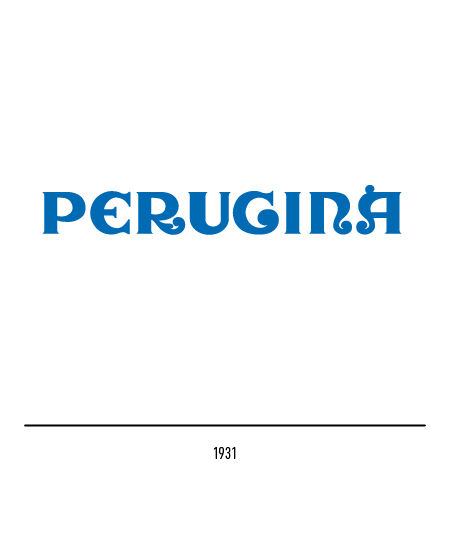 The restyling of 1939 aimed at streamlining and compacting the logotype. The "A" lost its curl and the non-rampant, left-facing griffin was recovered. 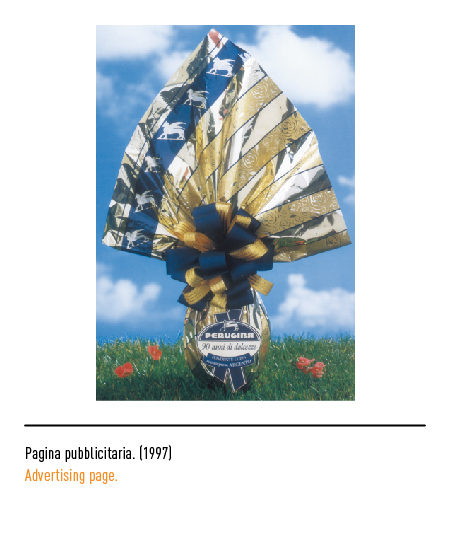 In 1985 the trade-mark was set inside a compressed golden octagon also showing the date of establishment. 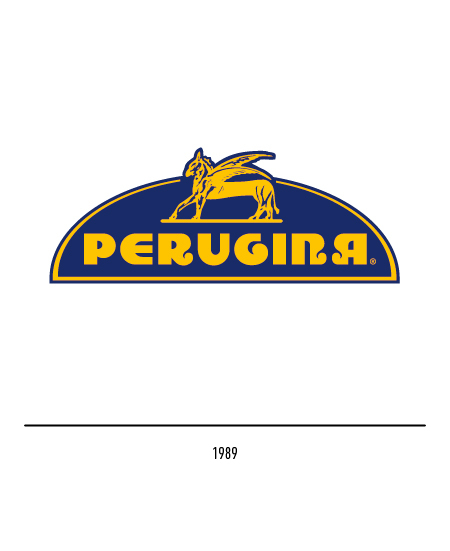 The golden griffin and logotype were set inside a blue semi-circle with a golden contour. 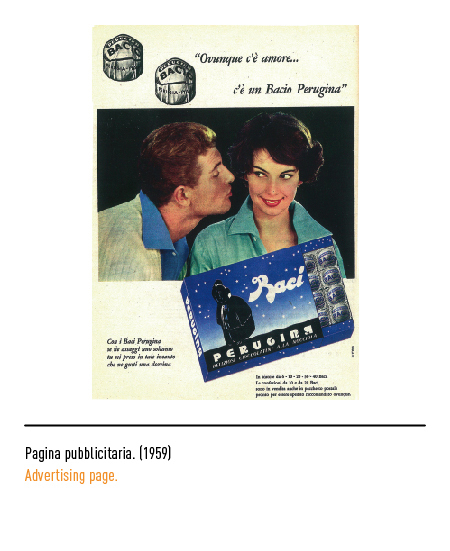 The wide range of make ups witnesses to the trade-marks great and undiminished viability despite its age, showing how innovation and tradition can go hand-in-hand to successfully meet the challenge to corporate identity of an increasingly complex and global market scenario. In 2002 lettering was streamlined and modernised by Landor Associates, while the griffin appearing as a silhouette on a portion of the arch was the work of the Break agency. 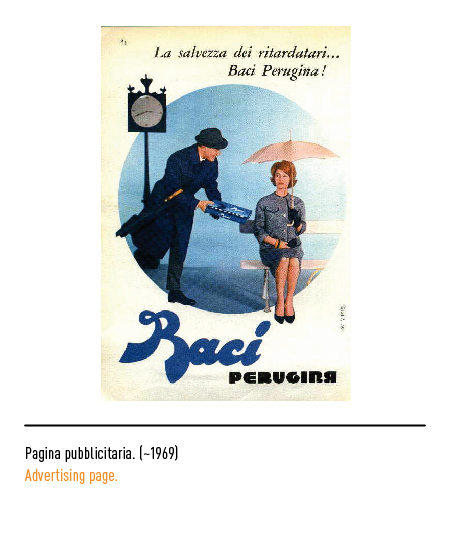 "Bacio Perugina" is definitely the house's front-liner. 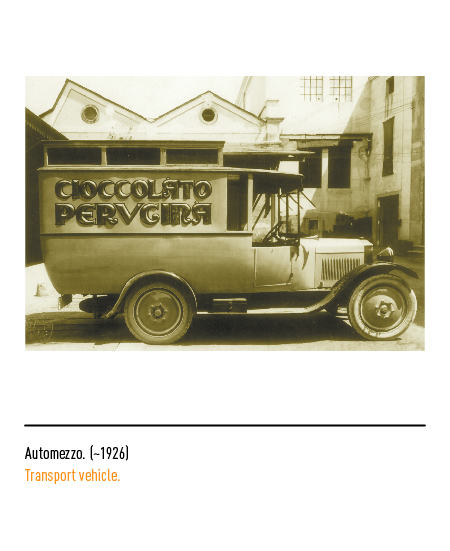 Indeed, popular consumption of chocolate in Italy can be said to have started in 1922 with the launching of this truly "democratic" product. Legend has it that this "people's chocolate" was initially called "cazzotto" ("fist") by way of its lumpy shape. 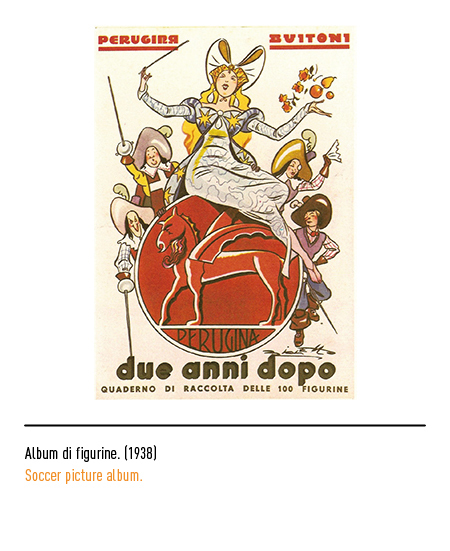 In any case, it quickly became known by its more romantic name that lends itself easily to word-play and amusing allusions. 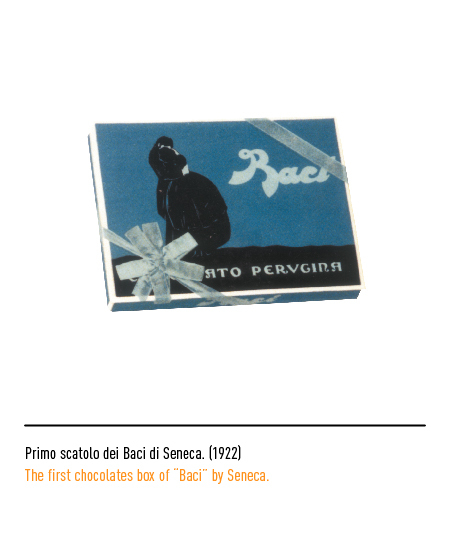 The "Baci" box was designed by one of the most acclaimed commercial artists of the twenties, Federico Seneca who took his inspiration from the painting by Francesco Hayez, "Gli innamorati" ("The Sweet-hearts"). 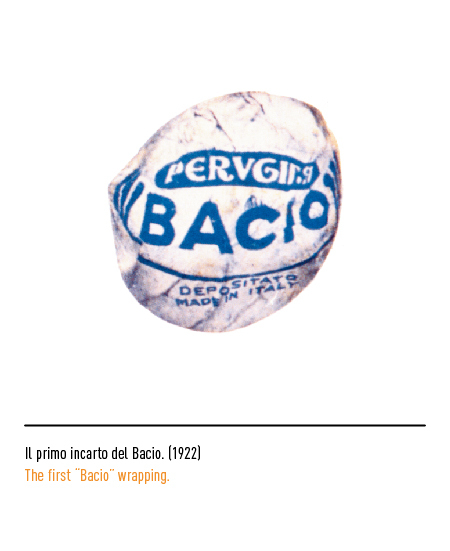 He was also the inventor of the popular "scroll" or love-message tag that still forms the inner wrapper of the "Baci". 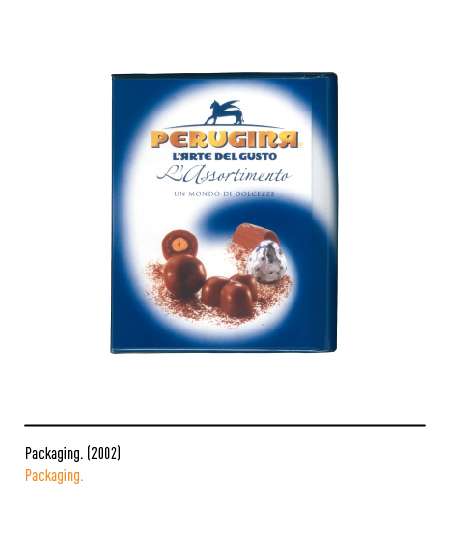 Over the years, the box has been restyled several times. 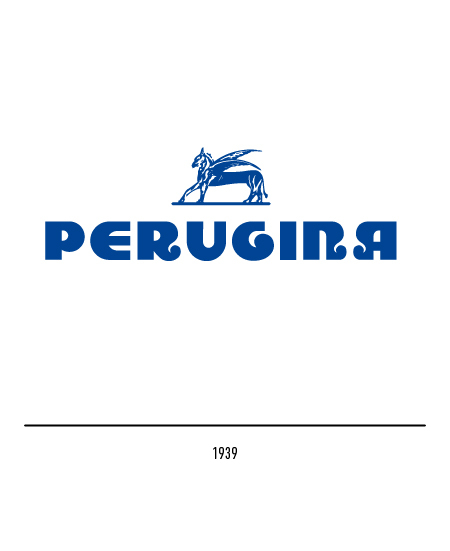 PERUGINA, UNA STORIA D’AZIENDA, INGEGNO E PASSIONE, a cura di Gianpaolo Ceserani, Renato Covino, Silvana Editoriale, 1997, Milano. 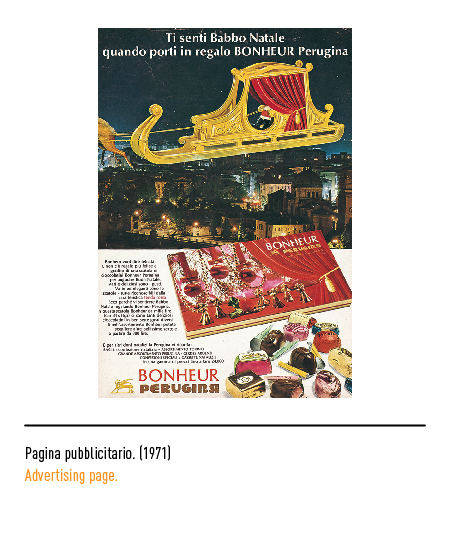 L’ITALIA DEGLI ANNI RUGGENTI RACCONTATA DALLA PUBBLICITÀ, esposizione e catalogo realizzati a cura di PROSPECTA agenzia di pubblicità, Verona, 2000. 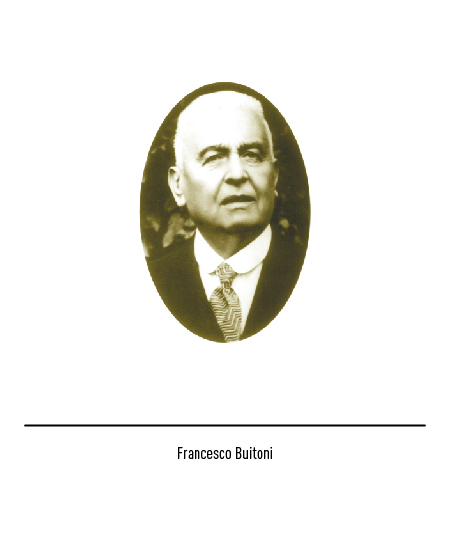 SULLA BOCCA DI TUTTI, a cura di Giampaolo Gallo, Electa Editori Umbri, Perugia, 1990.